Vancouver, British Columbia – September 13, 2018 – GGX Gold Corp. (TSX-v: GGX), (OTCQB: GGXXF), (FRA: 3SR2) (the “Company” or “GGX”) is pleased to announce it has received additional analytical results from its diamond drilling program on the Gold Drop property, located near Greenwood, B.C. Drill core analytical results have been received for 2018 drill holes EVE18-7 to EVE18-18 which tested the area of the Everest Vein, located in the Gold Drop Southwest Zone. The 2018 drilling also tested the COD Vein, located in the Gold Drop Southwest Zone, north of the Everest Vein. The highlight from these analytical results is 12.45 g/t gold and 121 g/t silver over 0.85 meter core length in altered granodiorite in drill hole EVE18-12. The Everest Vein, located south of the COD Vein, was first discovered by Company prospectors during the 2017. Chip samples collected in 2017 across the approximate 0.4 meter wide vein exposure returned up to 52.8 g/t gold and 377 g/t silver while a grab sample of a quartz vein boulder broken off the outcrop by the excavator returned 81.8 g/t gold and 630 g/t silver (News Release of August 21, 2017). The analytical results listed below are highlights from drill holes EVE18-7 to COD18-18 (intersections greater than 1 g/t gold), testing the area of the Everest Vein. Since true widths cannot be accurately determined from the information available the core lengths (meters) are reported. The gold, silver and tellurium analyses are reported in grams per tonne (g/t). 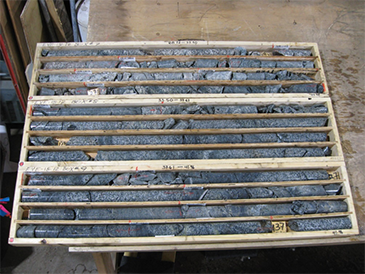 The intersection at 40.41-41.26 meters in drill hole EVE18-12 is altered granodiorite with pyrite. The other intersections listed in the preceding table are altered granodiorite with pyrite and / or veining (quartz and or calcite). 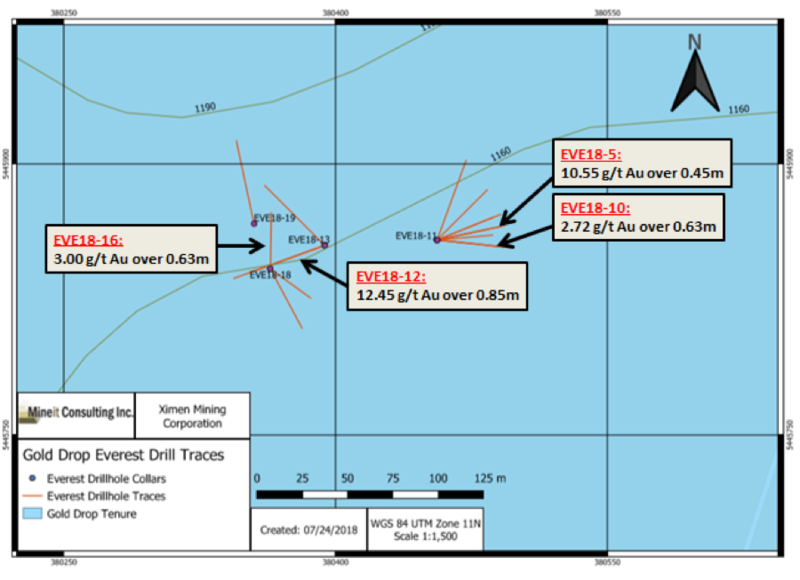 The Everest Vein 2018 drill holes are located approximately 350 to 800 meters south of the area of 2017 and 2018 COD Vein drill holes. In addition to the gold discovered by the Company at the COD and Everest veins, gold mineralization is reported in quartz veins in the east and north regions of the property. These include the Gold Drop, North Star and the Silent Friend quartz veins in the east region of the property and Amandy, Roderick Dhu, Lady of the Lake, Lake View and Moonlight in northern region of the property. High grade gold is reported for historic samples at some of these veins with samples reported to exceed 1 oz. / ton gold. Historic gold production occurred at the Gold Drop, North Star, Amandy and Roderick Dhu veins.